When you’ve got a sin to confess, it’s generally better to just come right out with it, so here goes: I am lazy with my salmon. I do a little salt and pepper and lemon, or maybe some sort of soy sauce thing, and yes let me just say it now, I’ve been known to slather a bunch of Trader Joe’s gyoza dipping sauce on it and pop it under the boiler. He chose Seared Salmon with Cinnamon and Chili Powder, and I could not have been happier, because it required me to do little more than reach into the kitchen cupboard and start cooking. I’m going to warn you right now, SippitySup is a bossy fellow. He calls you out for your desire to prematurely flip your fish; he won’t stand for it. He proclaims the wine you will be drinking (pinot noir), and will brook no free will on this either. But as is the case with many bossy people, you best listen, because he does lay out of a very good roadmap for getting this fish right the first time. What you’re working with is a basic spice rub, with an emphasis on the heat of chili with the fragrant nuttiness of cinnamon. I have an inherent aversion to canola oil, so I used peanut oil (discovered a few blogs back with tofu and now my new favorite pan lubricant) but that is the only variation I made to the recipe. I did however double it because I had two large slabs of salmon; I suggest you do the same as SippitySup wants you to rub both sides of the fish and you don’t want to come up short. Do as he says and cook it the exact amount of time that he calls for. Use the cast iron pan, please. Cook up some nice rice and maybe a green something or other to go with, and in half an hour you are going to find yourself awash in that feeling that, really, no one needs to eat in a restaurant. Just get someone else to clean the pan. I stumbled upon this recipe today and cooked it for dinner. I used wild salmon and, uncharacteristically, followed the directions exactly. It was delicious. Thank you sippitySup and Jennyb. Btw, I do all of the cooking and my husband does all the dishes. At the risk of stating the obvious, make sure that the salmon has been scaled first. Better fishmongers will do this as a matter of course. It's a lot harder to do once the fish has been filleted. Also, try salmon collars sometime, the most tender part. Also, I'd bet that the salmon pictured is farmed Atlantic, which if raised in a careful manner, is fine with me. I love that you show how to make the serving for 1, that is something that is not easy to come by! 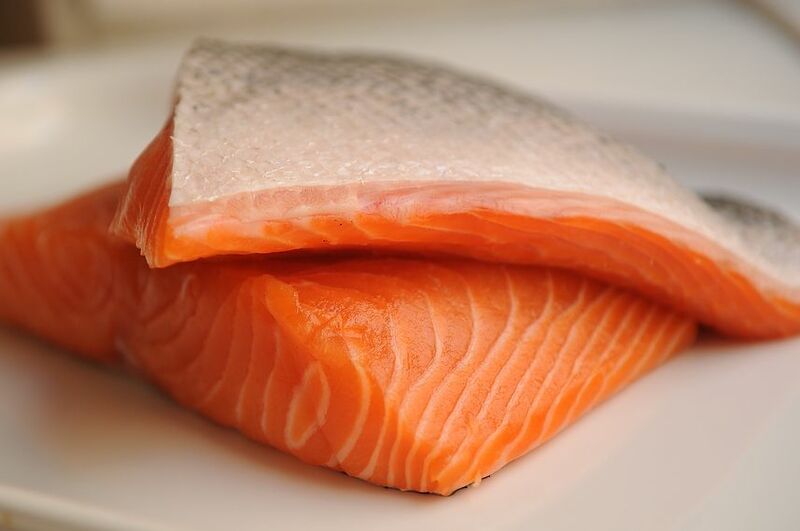 Salmon is so delicious by itself, it is easy to just throw it in the oven and eat it as is. This recipe sounds simple yet extremely tastey. I will never argue Pinot Noir. Thanks for the lovely post! I get green chile powder from New Mexican Connection (also fresh ones every fall that we roast/freeze) and it is superb on salmon. Great leftover, flake into omelet. that sounds really interesting. i need to flake fish into eggs. it is a great way to start the AM. I'm glad I'm not alone in my canola hatred -- I use olive or peanut oil for everything. I make something similar, but the rub is cinnamon, ginger, cumin, cayenne, sugar and salt. It's great with a hot mustard. divine. i love hot mustard!! This is more of a question: the other day I was making a chicken tagine, and I put rub together in small skillet to toast--I was supposed to cool, etc, but no time, so I sort of rolled my chicken pieces right in the toasting skillet. Seemed like it was even more flavorful. Would it hurt (or help?) to do this with the salmon? I think that method would not work well with this because it would most likely stick to the pan. But this is very easy -- it will only take you a few minutes to prep the salmon. Jenny, I love salmon and cook it at least once a week when it is in season. I am pretty lazy too (I already admitted that fact) but luckily less is best when cooking salmon. Where does your purveyer get fresh wild salmon since California had no salmon season this year? The great state of Alaska. I hope you make this and enjoy it! There is no fish market in little St. Helena ...we have to wait until after Easter and the farmer's market starts again. I won't go near what my local market calls "creative" salmon. Please tell Ed he has done an excellent job of recipe selection. Hope he'll return for some encore performances! Thank you for pointing out this recipe. (How did I miss it?) Looks fantastic and it's nice that you tested it for us! there are hidden treasures all through food52!! This sounds like a great recipe, and I love your suggestion about getting someone else to clean the pan! Isn't one of the best perks of doing the cooking not having to do dishes?